HomeBlogDealership WebsitesClick Dealer Launches New Blog Feature for Dealers! Click Dealer Launches New Blog Feature for Dealers! Click Dealer has created a brand-new blog feature for our dealers to be able to share news, tips and insights with customers, and we are giving it to you for a small, one-off set-up fee! Our previous blog product was very limited in its design and considering how beneficial a blog can be for search engine optimisation (SEO) and developing customer relationships, we decided that it needed improvement. The new blog has been created specifically to help you to engage users and achieve a higher rank on search engine results pages. We want all of our dealers to be able to reap the benefits a blog can bring, so we won’t be charging you monthly for this feature, you’ll just need to cover the cost of set up (£99) and then it’ll stay on your website for free! Insert images, videos, special characters, tables, bulleted lists and numbered lists. Schedule posts for future dates. Add tags and categories to make it easier for readers to find specific content. Upload a featured image and an excerpt which will be displayed on your main blog page. How Can It Benefit My Dealership? It is no coincidence that businesses with some of the best digital marketing consultants that money can buy have regularly updated blogs. Business blogging offers a host of benefits, from attracting more customers, to strengthening your relationships with existing ones. 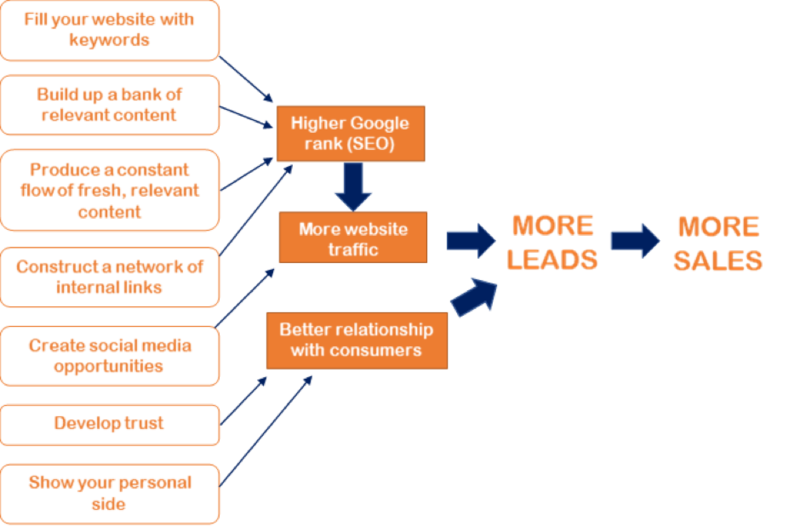 Generally, the more keyword-rich content on your site, the better your search engine rank will be for relevant queries. But beware! Search engines have become clever and if they think you are trying to stuff your site with keywords for the sole purpose of improving your rank, you will be penalised. A blog is the perfect way to fill your website with relevant words and phrases naturally. 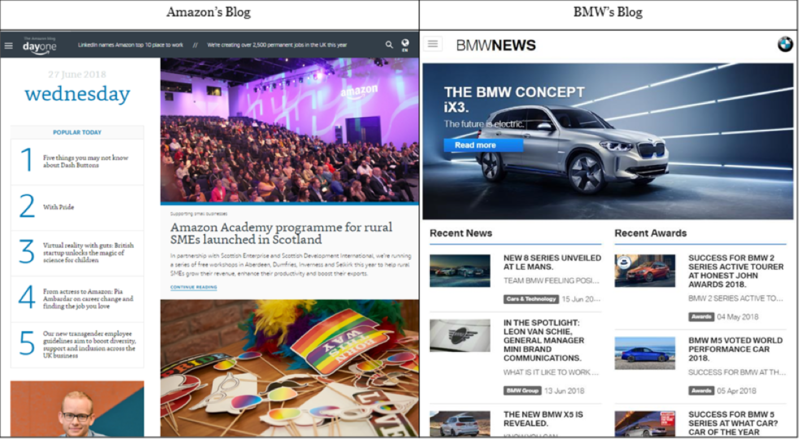 Unlike our previous blog which uploaded each article to the same page in a continuous stream of posts, our blog now creates a new page for every single article. These pages will all be indexed and will help your website rank for relevant search queries forever. Search engines give precedence to websites which are constantly updated as they are likely to be more relevant. Lead generation – If you publish an article explaining car finance on your blog, this is an excellent place to plant a link to direct readers to a finance form on your website. SEO – Internal links can help users find pages that might be useful to them, and as the objective of search engines is also to help people find useful content, they will reward websites with an interconnected structure. 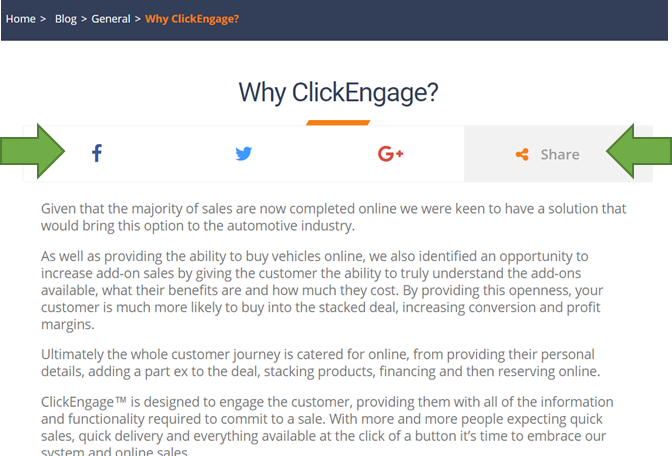 Click Dealer’s blog will automatically incorporate a share button on each article page, giving readers a convenient way to share your content on social networks, like Facebook, Twitter and Google Plus, which exposes your dealership to a wider audience. If you struggle to think of fresh content for your dealership’s own social media pages, blog shares are great for breaking up stock updates and driving traffic to your website. If you offer professional insights and helpful advice through your blog, customers will see you as an expert. This helps to increase their trust in you, and may make them feel more confident about buying from you. A blog also gives you an opportunity to reveal your dealership’s personal side, which consumers may be more receptive to, and by sharing blog articles on social media, and encouraging people to comment, you can start conversations and build rapport with potential customers, which could assist conversion. If you would like the new blog implemented on your site for the small, one-off cost of £99.00, get in touch with Click Dealer today by emailing us at marketing@clickdealer.co.uk, calling us on 01782 478 220 or messaging us via our contact page! If you would like to make use of our new blog but you do not have time to maintain it yourself, talk to Click Dealer to find about more about our in-house content writing services and paid blog packages using the above contact details. We have been ClickDealer customer since we started in day 1. Although slightly disappointed that we have to pay an additional £100, we definitely want to have the blog feature ASAP. Just want to make sure I can easily get an article from the internet & share it online. Can you let me know the next steps.